Every now and then, I’ll see something in a store and think ‘pssshh, I can make that’. Y’all know I’m cheap fiscally responsible, so if the pricetag offends me and it’s something I believe I can DIY (which is pretty much anything), I will get to makin’. Remember these DIY Zara inspired slides? 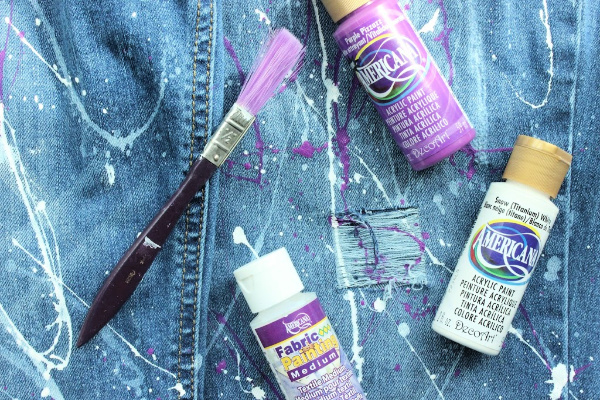 Well, a while back, I started seeing jeans that were not only distressed, they were painted. PAINTED. I’m nothing if not extra, so this was my kinda look. 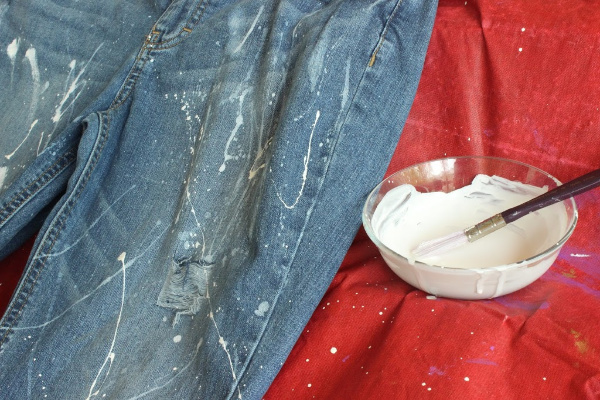 70 American dollars for paint splattered jeanssss??!! I think not. So I grabbed a pair of thrifted jeans, some acrylic paint in the colors of my choice and got to work. I only used two colors but you can use as many as you like. Do you boo! You’ll also need a paint brush, tarp or something to protect your work area (I used a plastic tablecloth from the dollar tree) and some fabric medium to mix into the acrylic paint. 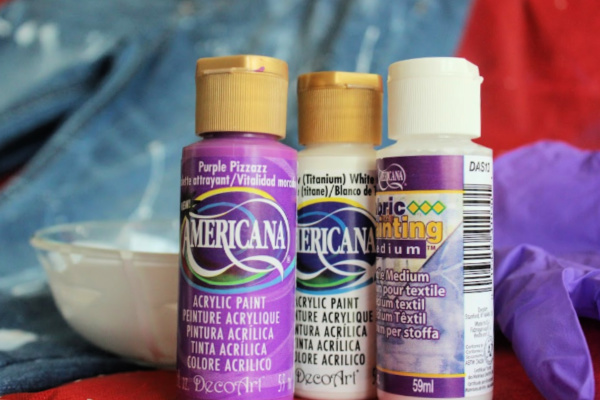 The fabric medium allows the paint to bond to the fibers without cracking, peeling or fading even when washed. What say you? 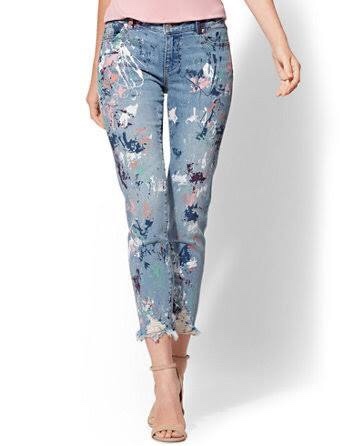 Are you feeling the splatter painted jeans? Are you team buy or DIY? I am living!! Girl I’m the same way lol, it’s a lot of things in stores that I can and will make for myself! Great jeans! Sometimes I set my sights too high LOL but I will give it a try! I sure am, I need to splatter me a pair. I didn’t know about this fabric medium situation. That explains why one of my designs is cracking. I do however have lots of splattered sneakers. The master crafter didn’t know about the fabric medium?! I’m SHOCKED. I think I want to splatter me up a pair of Chucks too. As soon as I saw 70 for that I was like whatttttttt. Make that yourself. It came out great too. 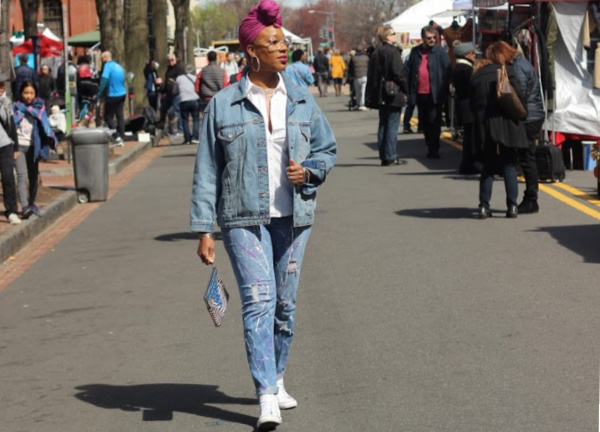 I love the splatter jeans with the headwrap. Cute combo and easy fashion to have for the spring!